The Spring Boot Dashboard in the Spring Tool Suite provides an easy way to start up a local Spring Boot project and connect it to a running microservice system that is running on Cloud Foundry. This is done by tunneling the local application via ngrok to the outside world and register the URL of the tunnel with the remote Eureka service registry on CF. This feature of the Spring Boot dashboard is described in more detail in the second part of our blog series about the Spring Boot Dashboard in STS. This feature was designed to be used and is working with a remote Eureka service registry that you deployed yourself as a Spring Boot app. It doesn't work yet with Eureka service registries that you get when using the Spring Cloud Services on PCF. 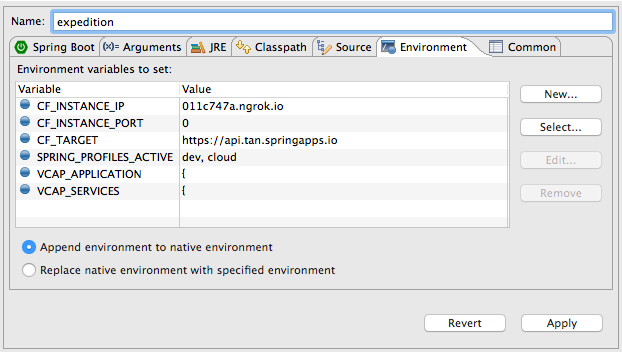 While the direct support of this feature for SCS will be part of a future release of the Spring Tool Suite, this document describes in detail how to tunnel a local application via ngrok manually when using Spring Cloud Services. As an example for this tech note I will use the SCS demo application that consists out of a service called "camelboy" that uses another service called "expedition". The expedition service will be the one that I am going to run locally. The camelboy service will keep running on PCF. You need to have ngrok installed on your local machine. You can download it from the officla ngrok download page. The 8080 is the port on your local machine that you would like to tunnel to the outside world. In our case it is the port that is used by the local Spring Boot app that we would like to run locally and connect to the other microservices that are running on PCF. 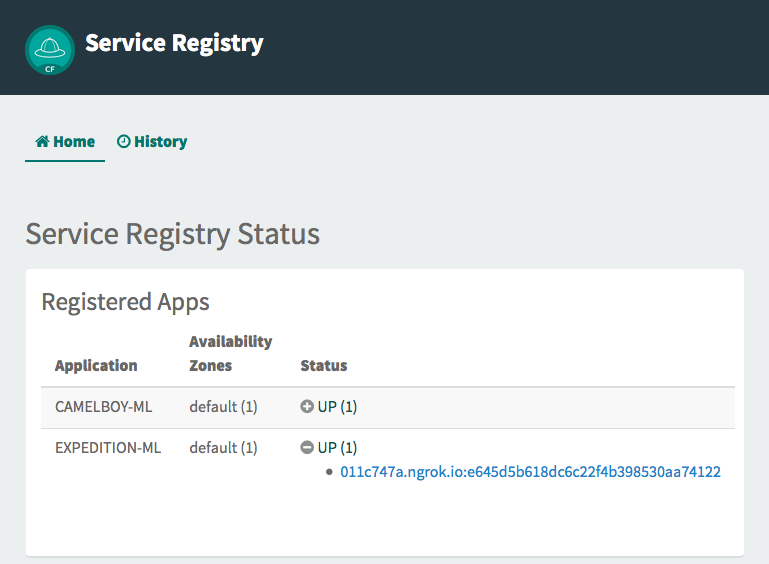 As a next step we need to configure the launch configuration of the local Spring Boot app in a way that it registers itself with the remote service registry that is coming from Spring Cloud Services. This gets a little more complicated because the remote service registry is running in a secure mode and protected via OAuth. First, we need to set a name for the application. This name is being used to register the application with the remote eureka and has to be the same that you use when deploying the service to PCF and the same that you use when looking up the service in your code. 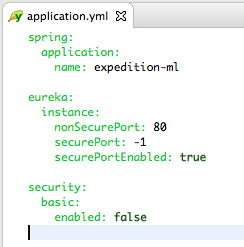 Second, we configure the eureka registration in order to be able to deal with the secure ports on PCF. The "-1" as the secure port looks a bit strange, but it will cause the spring cloud implementation to use the standard port for https (which is also the one that is being exposed by ngrok for the https tunnel). Third, we disable the basic security that gets enabled by default otherwise. This helps us to test the local app with a browser without the need to login. There is nothing mentioned about the ngrok tunnel URL yet. So how does the local app know how to register with the remote Eureka? The next step is to configure certain environment variables for your local Spring Boot application. Therefore open the launch config dialog, select the launch configuration you would like to use and switch to the "Environment" tab. CF_INSTANCE_IP - This is the ngrok tunnel URL (without a leading https://). CF_INSTANCE_PORT - Set to "0" (zero). CF_TARGET - This is the target API of your PCF environment and particularly useful if your PCF environment uses a self-signed certificate for https. SPRING_PROFILES_ACTIVE - set to "dev, cloud" to get Spring Cloud to register with the remote Eureka correctly. VCAP_SERVICES - This one defines the remote Eureka service that should be used together with its keys (as a JSON string). VCAP_APPLICATION - This one defines the application and contains again the ngrok tunnel URL of the local app (as a JSON string). The VCAP environment variables consist out of JSON strings that are (on PCF) set by the PCF environment in order to pass important service information to the application. The best thing to obtain those two JSON documents is to open the web console of your PCF environment, go to the deployed version of your local service and take a look at the environment. It contains a single JSON string which contains the VCAP_SERVICES definitions as well as the VCAP_APPLICATION section. We need to cut those sections out into individual JSON strings. Both JSON strings can be copied into the environment variable configuration of the launch configuration editor that we opened a while ago. Whereas the setup and configuration steps above are somewhat cumbersome, working with the once registered boot app locally is a pleasure. You can debug the app locally on your machine and restart it as any other local app. This can save a lot of time, compared to re-deploying a changed app to your CF environment. This whole setup process will be a whole lot simpler when STS can do many of the steps for you.